Explanation: Awkward and angular looking, Apollo 17's lunar module Challenger was designed for flight in the vacuum of space. This sharp picture from the command module America, shows Challenger's ascent stage in lunar orbit. Small reaction control thrusters are at the sides of the moonship with the bell of the ascent rocket engine itself underneath. The hatch allowing access to the lunar surface is visible in the front and a round radar antenna appears at the top. This spaceship performed gracefully, landing on the moon and returning the Apollo astronauts to the orbiting command module in December of 1972 - but where is Challenger now? Its descent stage remains at the Apollo 17 landing site, Taurus-Littrow. 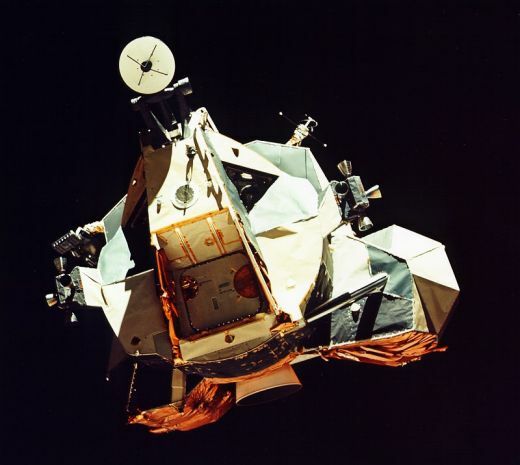 The ascent stage was intentionally crashed nearby after being jettisoned from the command module prior to the astronauts' return to planet Earth. Apollo 17's mission was the sixth and last time astronauts have landed on the moon. Editor's note: Eric Jones, Apollo Lunar Surface Journal editor, comments; "If you look at the [... large, dark] triangular window, you'll see a bright rectangular area - which is the rendezvous window - beneath it, a bright arc. After much discussion, my team of volunteers and I concluded that the bright arc is the top of [mission commander] Gene Cernan's bubble helmet lit by sunlight ..."